Purdue University has a long-standing reputation for excellence in the area of agricultural animal behavior and welfare research. The pioneering work of Dr. Jack Albright on dairy cow handling, management and welfare in the early 1980's laid the foundation for new, fruitful collaborations in poultry well-being led by Drs. Patricia Hester and William Muir in Animal Sciences, and with the USDA-ARS Livestock Behavior Research Unit (LBRU), which is currently housed in the Department of Animal Science. The LBRU's mission to develop scientific measures of animal welfare that facilitate objective evaluation of animal agricultural practices significantly expanded Purdue's capacity for graduate student training and research, particularly in poultry and swine welfare. Purdue's history of excellence in farm animal welfare was further enhanced by the contributions of Dr. Paul Thompson, renowned philosopher of agricultural, food and community ethics, who joined the Animal Sciences faculty from 1997 - 2003, providing leadership as the Director of the Center for Food Animal Well-Being. That Center aimed to coordinate the relevant efforts of faculty within the Colleges of Agriculture and Veterinary Medicine, a charge which was later assumed until 2009 by Dr. Ed Pajor, internationally recognized expert on agricultural animal welfare. The scope of species coverage on animal welfare offered at Purdue expanded in 2004 with a new line of laboratory animal welfare science introduced in Animal Sciences by Dr. Joseph Garner. This work, along with innovative research conducted by the Center for the Human-Animal Bond, led by Dr. Alan Beck in the Purdue College of Veterinary Medicine, offered new potential for Purdue to distinguish itself from its peer institutions by combining collaborations in agricultural, companion, and laboratory animal welfare with expertise in the social sciences, covering ethics, psychology, policy and economics. The collective capacity to build high impact, cross-disciplinary research, teaching, and engagement teams, along with the need for more cohesive effort and improved program visibility led to the impetus to create a new Center for Animal Welfare Science. 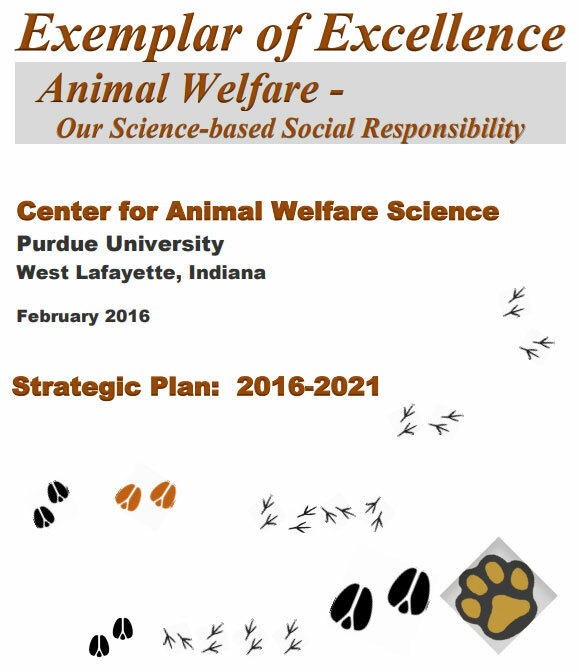 Funded in 2012 by a provost's initiative to create new areas of excellence at Purdue, the Center for Animal Welfare Science (CAWS) was formally established in 2014. Supported jointly by the Colleges of Agriculture and Veterinary Medicine, and led by Dr. Candace Croney, CAWS aims to address contentious social issues in animal welfare, inform policy development, and explore the broad effects of the human-animal bond, our obligations to animals, and their evolving roles in society. Building on decades of institutional support that began with a vision by Dr. B.R. Baumgardt, former associate dean and director of agricultural research programs, Purdue University now hosts the most species-diverse and highest number of faculty in the United States dedicated to the study of animal welfare science.